Nestled on 2.62 plus hectares (6.5 acres) in among privacy and natural beauty; this solid masonry 354 square meters executive styled residence will delight you upon arrival. With four bedrooms and four en-suites, a music/reading room that easily lends to a fifth bedroom if needed along with guest WC, the home is a living sanctuary that feels intimate but can accommodate a lot of people. The light contemporary ambience with stainless appliances and glass splash backs compliment the robust granite bench tops whilst the Karndean wooden floors lend warmth and integrity to this sleek and highly functional kitchen. Offering state of the art cooking appliances including steam, pyrolyctic and microwave/convection ovens, gas cooktop, dishwasher, down-draft and French door plumbed refrigerator, and a large walk-in-scullery with complimenting granite benches and the must have wine fridge mean any gourmet cook will be very happy and content with whats on offer here. The open plan kitchen/dining/living with roaring wood burning fireplace and Hinuera stone hearth creates a multi-functional zone with a wonderfully relaxed ambience, enhanced by underfloor heating throughout. Double glazed windows and doors make the home thermally stable - warm and sunny; the family living area faces due north and leads out to an expansive paved outdoor entertaining area overlooking wonderfully established raised garden beds and landscaped gardens beyond. A second indoor-outdoor flow from the western end of this living zone allows for the obligatory G & T seating area for end of day sun-set tipples. 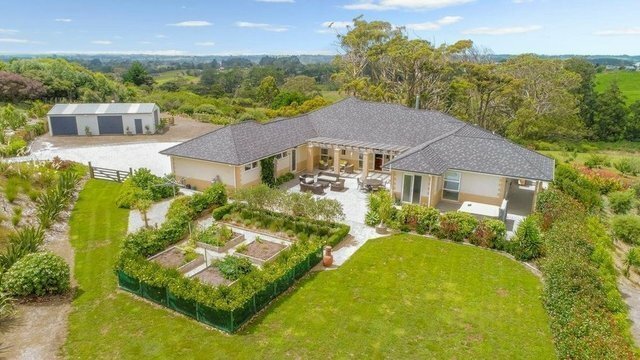 The formal living room overlooks the homes citrus and fruit grove and neighbouring farms provide picturesque views that create another restful living zone to retreat to. A separate office and separate laundry, internal three car garaging ensuring the various living spaces work well for any family formula. A large 6.5 x 12.4m three bay shed with extra height for boat or float entry, and large off street parking bays completes the perfect home and opportunity for discerning buyers.